Fournier (Regina, Canada, 1989) is a curator, writer, artist and researcher. She is the author of Fermenting Feminism, a mutant art programme that focuses precisely on the symbolic and material potential of this process. Initiated in 2017 withtheLaboratory for Aesthetics & Ecology, Fermenting Feminism has so far organised five different events that included screenings, listening sessions, group shows, experimental gatherings, a group-authored and co-edited publication, and a performance festival with pieces by Regina de Miguel, Leila Nadir, Zoë Schneider, WhiteFeather Hunter and Sarah Kantrowitz, among others. Fermentation is a natural process of enrichment in which the ‘mother’ procreates, regenerates, feeds, cares and self-replicates or updates herself. In its physical and figurative versions, for Fournier this is a way of approaching contemporary transnational feminisms. Its main interest lies in its double capacity to preserve and change, ‘that ability to preserve, retain and honour the past and at the same time transform, take on new shapes and configurations’. With these references to the ‘mother’ and to diet, we return to the home in a justificatory sense as a non-colonial space of care and protection, of slow tempos, of matriarchal legacy, of ‘do it with others’, and of liberating processes. One example of this is PEFA Projects, developed by Sean Roy Parker and dedicated to collective fermentations with educational and ecological objectives starting from community art, opening up common spaces for collective reflection and action on expense, reuse, the natural environment, DIWO (Do It With Others) and healthy diet, creating affective communities. We no longer take the house as the symbolic space of oppression described by Martha Rosler or Chantal Akerman, but as an open space of empowerment in which we can escape from capitalist anxiety and instantaneity, from pre-cooked dishes, plastic packaging or masculinised haute cuisine. It’s a house open to collective experience, like FOOD, the restaurant opened by Caroline Gooden and Gordon Matta-Clark in New York in 1971, that understood digestion as another way of occupying space, or like Espai Nyamnyam, whose collective cooking processes are feminist culinary experiences. Fournier recognises the queer ecologies of wild fermentation developed by Sandor Katz, author of Wild Fermentation: The Flavor, Nutrition, and Craft of Live-Culture Foods (Chelsea Green Publishing, 2003) and takes them as a starting point in her practice. ‘Wild fermentation is a way of incorporating the wild into your body, becoming one with the natural world. Wild foods, microbial cultures included, possess a great, unmediated life force, which can help us lower our susceptibility to disease and adapt to shifting conditions. 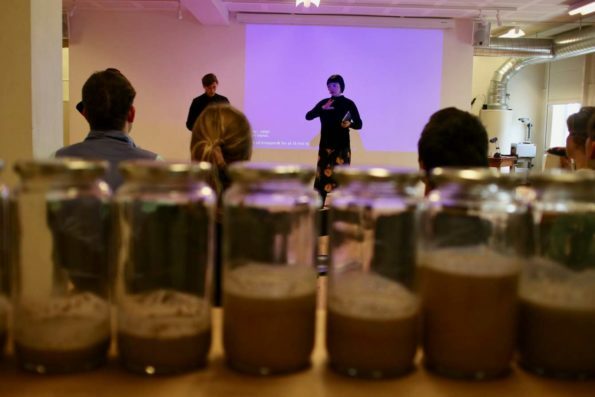 These microorganisms are everywhere, and the techniques for fermenting with them are simple and flexible.’ According to the curator, the tension produced between the vessels and their exterior in terms of receptivity or absorption is important to understand the feminist politics inherent in the practice of fermentation. Active ferments can be smelt and heard; they bubble and spill over their containers — they are alive. This is a symbiotic relationship between species in which human beings do not exert their superiority but merely collaborate; as such, it is understood as an intersectional feminist activism. Fermentation as sorority; a physical connection. We eat in order to be connected: we introduce microbes into our microbiome and, in their turn, they introduce us into their ecosystem. This twinning with other species and with other objects on the part of human beings accustomed to a growing individualism is one of the firm fermentation proposals in terms of feminist politics; a sort of transcendence of the self as a closed subject; an ontological opening to everything else. Indeed, it doesn’t only connect us to other living creatures, but also to the technological as an extension of the living. Turning here to Donna Haraway, as Fournier reminds us, we are able to understand the Microbial Selfies (2017) by EcoArtTech (Leila Nadir and Cary Peppermint), in which, thanks to the right combination of software and hardware, certain microbes can take selfies of themselves and edit them bearing in mind a series of variables like the pH, the colour or the oxygen detected, assisting the recovery of a cultural memory that had disappeared after the industrial amnesia. This reading of the biological-material process of fermentation responds to an ontology closer to Spinoza than to Descartes, proposed by the new materialisms of Karen Barad and Isabelle Stengers, the vitalism of Jane Bennett and the necropolitics of Achille Mbembe, Fred Moten and Stefano Harney, mentioned by Fournier. Connected in this way with Women Studies, Food Studies and post-colonial thought, not so much a genealogy as ‘a bubbling of different forms and extensions, and of diverse effects, over the course of history’, fermentation conceives food as a social factor affected by colonial movements or elements of class and gender, as Sugar Organ from the Laboratory of Aesthetics and Ecology does in the Fermenting Feminismpublication. Fermentation is, therefore, a liminal practice situated on the margins of art, science, technology, design, cooking, the preparation of beverages, witchcraft and speculation. It partakes of recipes, sculptures, relational artworks and laboratory experiments, a laboratory that has been out of bounds for women as objects of knowledge that is democratised when it becomes a sort of kitchen for a queer subject. This is an embodied knowledge (theoretical and practical), whether it takes the form of a performance, a workshop or a gathering based on a community element, or appears as an interpretation of the signs that microbes offer us and for which we have no manual or exact formula. Due to the unpredictable behaviour of microbes, we have to examine them, protect them, attend to them, learn from the sounds they emit and from the changes in their tonality and flavour in order to stop the process at the desired degree of acidity. Hence, fermentation enables us – again, both metaphorically and physically – to conceive new ways of being and of thinking, new forms of criticism, collectivity and governance thanks to an alliance between species, that gathers us around a table to enact transformations starting from care. 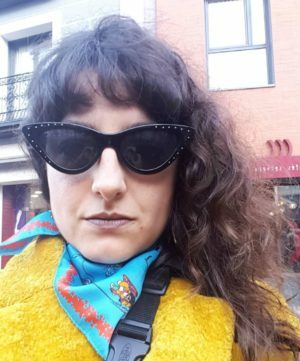 Working in the fields of philosophy and art history, Marta Álvarez develops her practice as a cultural mediator and curator on the periphery of the Castilian meseta. Focusing on feminist practices and free culture, her proposal unfolds in exhibitions, series, texts, talks and workshops. She is a member of the Mediation Group of Laboratorio 987 at the Museo de Arte Contemporáneo de Castlla y León (MUSAC), and is learning ecology, while trying to teach at secondary-school level.